Starting with just 20 Sea Harriers, a further eight joined the Task Force by mid-May. A total of six were lost by accident or ground fire, and not one in air-to-air combat. [b1, b2] - Two Wessex HU.5's of C Flt, No.845 NAS, RFA Tidespring crashed on Fortuna Glacier, South Georgia in bad weather. All crew rescued. [b3] - Sea King HC.4 of No.846 NAS embarked on HMS Hermes crashed into the Atlantic at night in bad weather south west of Ascension (8.15 pm). Pilot rescued but PO Aircrewman Casey lost. [b4] - Sea Harrier of No.800 NAS, HMS Hermes shot down over Goose Green by radar-controlled, 35mm Oerlikon fire (1.10 pm). Lt Taylor RN killed. 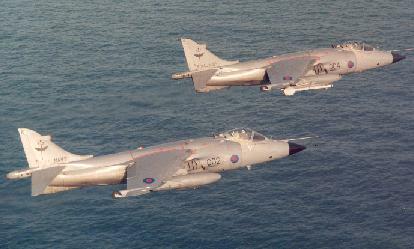 [b5, b6] - Two Sea Harriers of No.801 NAS, HMS Invincible lost in bad weather, presumably by collision, south east of Falklands (9.00 am). Lt Curtiss and Lt Cmdr Eyton-Jones RN lost. [b7] - Sea King HAS.5 of No.826 NAS, HMS Hermes ditched in sea with engine failure east of Falklands (2.35 pm). All crew rescued. [b8] - Sea King HAS.5 of No.826 NAS, HMS Hermes, then to the east of Falklands, hit the sea late at night because of altimeter problems (10.30 pm). All crew rescued. [b9] - Sea King HC.4 of No.846 NAS deliberately destroyed by its crew near Punta Arenas, southern Chile around this date. [b10] - Sea King HC.4 of No.846 NAS, then embarked on HMS Hermes crashed into sea north east of Falklands, believed at the time due to a bird strike although this is now open to doubt (7.15 pm). Of 30 men on board, the aircrewman, 18 men of the SAS, a member of the Royal Signals and the only RAF man killed in the war are all lost. The two pilots were saved. [b11, b12] - Two Gazelles of C Flt, 3 CBAS shot down by small arms fire near Port San Carlos (c8.45 am). Pilot Sgt Evans RM killed in the first incident and pilot Lt Francis RM and crewman L/Cpl Griffin RM in the second. [b13] - Harrier GR.3 of 1(F) Sqdn RAF shot down over Port Howard, West Falkland probably by Blowpipe SAM (9.35 am). Flt Lt Glover ejected and injured, was taken prisoner-of-war. [b14] - Lynx HAS.2 of No.815 NAS destroyed in bombing attack on HMS Ardent in Grantham Sound by Daggers of FAA Grupo 6 (2.40 pm). [b15] - Sea Harrier of No.800 NAS, HMS Hermes crashed into sea north east of Falklands shortly after take-off and exploded (7.55 pm). Lt Cmdr Batt RN killed. [b16] - Lynx HAS.2 of No.815 NAS lost when HMS Coventry sunk north of Pebble Island in bombing attack by A-4B Skyhawks of FAA Grupo 5 (3.20 pm). [b17 - b22] - Six Wessex HU.5's of No.848 NAS D Flt; [b23 - b25] - Three Chinook HC.1's of 18 Sqdn RAF; [b26] - Lynx HAS.2 of No.815 NAS, all destroyed by fire when "Atlantic Conveyor" hit to the north east of Falklands by Exocet from Super Etendard of CANA 2 Esc. [b27] - Harrier GR.3 of 1(F) Sqdn RAF shot down over Goose Green probably by 35mm Oerlikon fire (1.35 pm). Sqdn Ldr Iveson ejected to the west, hid up and later rescued. [b28] - Scout of B Flight, 3 CBAS shot down near Camilla Creek House, north of Goose Green by Pucaras of FAA Grupo 3 (11.55 am). Pilot Lt Nunn RM was killed. [b29] - Sea Harrier of No.801 NAS, HMS Invincible ready for take-off, slid off the deck as the carrier turned into wind to the east of Falklands (3.50 pm). Lt Cmdr Broadwater RN ejected and was safely picked up. [b30] - Harrier GR.3 of 1(F) Sqdn RAF damaged near Stanley by small arms fire from Argentine troops. Ran out of fuel short of "Hermes" and Sqdn Ldr Pook RAF ejected to be picked up to east of the Falklands (12.20 pm). [b31] - Sea Harrier of No.801 NAS, HMS Invincible shot down south of Stanley by Roland SAM (2.40 pm). Flt Lt Mortimer RAF ejected and was later rescued from the sea. [b32] - Gazelle of 656 AAC Sqdn accidentally shot down west of Fitzroy by Sea Dart SAM fired by HMS Cardiff (1.10 am). Pilot, Staff Sgt Griffin, crewman L/Cpl Cockton and two Royal Signals passengers killed. [b33] - Harrier GR.3 of 1(F) Sqdn RAF landed heavily at Port San Carlos with partial engine failure, and was damaged beyond repair (12.00 pm). Wing Cmdr Squire escaped unhurt. [b34] - Wessex HAS.3 of No.737 NAS destroyed when HMS Glamorgan hit by land-based Exocet off Stanley (3.35 am).